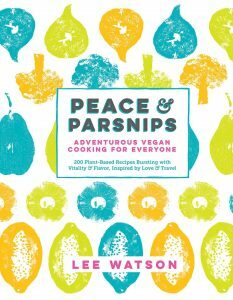 Peace & Parsnips Cookbook Review by VegansEatWhat.com Vegans Eat What? Help support VegansEatWhat.com – buy this book via our Amazon website! The cookbook contains creative and interesting combinations of ingredients in the recipes. Most recipes include vibrant, tantalizing photos. The font is easy to read, a feature that may not be truly appreciated until one has cooked from cookbooks with font that is too small, too pale, or simply doesn’t allow the eye to flow easily. Each recipe is introduced with personal comments ranging from the country of origin to how well it may freeze. We would have preferred that the author used actual measurements in the recipes where he used estimates such as “a handful”. Ingredients that were sometimes difficult to find were included in the ingredient lists, but we found it easy to substitute other readily found, similar ingredients. An example of this is using regular broccoli for Purple Sprouting Broccoli. We tried a variety of recipes from this cookbook and loved that so many focused on fresh ingredients. This is not a book that uses prepared or packaged foods as starting points. The recipes we tried included Adzuki Bean and Oat Soup, Charred Fig and Arugula Salad with Lemon Tofu Feta, Eggplant and Tomato Nut Roast with Macadamia Mustard Sauce, Maple and Orange Glazed Tempeh with Bok Choy and Soba Noodles, Pappardelle with Artichoke and Almond Sauce, Purple Kale and White Asparagus, and Cauliflower Cashew Cheese with Purple Sprouting Broccoli. Below we share Charred Fig and Arugula Salad with Lemon Tofu Feta. To make the tofu feta, put the nutritional yeast into a bowl with the lemon juice and zest and leave to dissolve. Heat the oil in a small frying pan on medium heat and add the garlic and tofu. Panfry until slightly golden, the add the lemon mixture, salt and pepper, bring to a boil and cook until the lemon juice has evaporated. Spoon into a bowl and allow to cool. Check that it’s just a little too salty, like feta. To make the dressing, whisk together the lemon juice, brown rice syrup, vinegar, salt and olive oil in a small bowl. Mix the arugula and basil leaves together in a bowl. Drizzle 1 Tablespoon of the dressing over the leaves and toss together. Keep the rest of the dressing for further dipping and drizzling. Warm a grill pan on high heat and brush with a little oil. Just as the oil begins to smoke, place your figs widthwise in the pan. Allow to cook for 2 minutes, basting them with balsamic vinegar as you go. Turn them when well caramelized, then remove the now sticky figs from the heat. 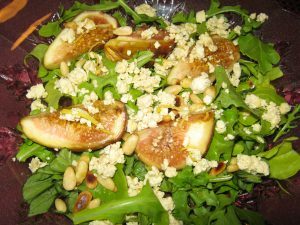 Scatter the leaves artfully on plates, and top with the warm figs, a couple of spoonfuls of the tofu feta and a sprinkling of toasted pine nuts. Reviewer’s note: Nutritional yeast flakes are easily found in natural foods stores.